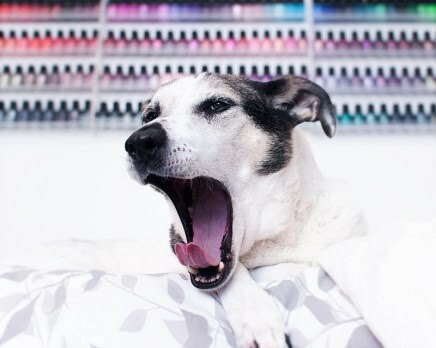 Polish Hound: Mail-time: Collective Polish Haul, Three Months: Jan-Mar. Mail-time: Collective Polish Haul, Three Months: Jan-Mar. Happy Friday, everyone! I don't know about you, but it's been a long week! Today I just have a mail-time to share with you! But, it's a collective mail-time, and will contain all of the polishes I've acquired in the first three months of 2015...by mail, anyway! The only polishes I've picked up in person have been L'Oreal- Masked Affair & Bad Bad Grey, as well as two Sinful Colors, including Shamrockin' and Love Sprinkles. Is that weird? I decided to do this as one big mail-time since I had several smaller orders, and I didn't want to create way too many mail-time posts! Hopefully you'll find something you want to see swatched here- just let me know, and I'll take everyone's comments into consideration for upcoming swatches! I can't remember if this^ is pre-sneeze or something else, but Ham-unit is not always amazingly photogenic, haha! Now I feel slightly guilty for so rudely interrupting his important napping schedule! Let's look at the polishes- I've broken everything down into their separate orders, of course. I didn't realize Urban Outfitters sold any of their polish online, but I was shopping for pants, so I had to try the house brand, since I never had before! Of course, when I realized that they also carry Paul & Joe polish, I had to pick one up as well! (Some are online exclusives, as well.) You can see a swatch of Paul & Joe- Plumes de Paon here. I definitely had to grab some of the new Spring polishes when they were released! The first from left, KBShimmer- Sugar Plum Faerie, is a long-time lemming of mine, but the rest of these are from the new Spring 2015 collection, which as a whole really spoke to me! Pastel glitter crellies....yes! I am planning on swatching the Spring polishes, but it won't be for a while! (I'll let you know why at the end of the post!) I have already used KBShimmer- Eyes White Open as a base for nail art, and hello new favorite white! I am totally thrilled about this white- two coats, very nice formula! I have also seen people stamp with it with good results. Totally does not disappoint! I decided I really needed Picture Polish- Sizzle after all, and a couple of the Barry M Gelly Hi-Shines had been restocked, so I had to add a couple of those since I've been lusting after all of them forever. The rest of these polishes....fell into my cart? The Creative Shop stamper! I'm really into squishier stampers, so I absolutely had to see this one for myself! I haven't had a chance to try it yet, but soon! I'm thinking about doing a review/ comparison with this new stamper, but I am not a stamping expert, so I'm kind of on the fence about it. These are actually Winstonia brushes, and the Amazon order was fulfilled through the Winstonia Store (winstonia.com). It's just a set of 5 nail art brushes of different sizes! I only had one before this that I hated, so these are filling a nice void in my arsenal! Next, this came in the mail! I actually won this baby, Julep- Hartleigh, in Mrs Mosh's Valentine's Day giveaway! I've never won anything in a blog giveaway before, and never tried Julep at all, so this was pretty exciting! It's prettier than my photo captures too: it has all kinds of sparkly microglitter that isn't picking up! Thanks, Jeanatte! I can't believe it but I forgot to include Illamasqua- Loella in this photo, and it's my favorite one from the order!! I actually had to be patient because the last Loella was in someone's cart, but I was finally able to snag it! Can't believe I forgot to include it! I had to get Rain Dogs, swatched here, and Jackalope I have wanted for quite a while. There were a few more I was having indecision about, but at this point in the year I was trying to "low buy," so two it was! Serum No. 5 had a 30% off deal to celebrate the Chinese New Year, so I thought it would be a good time to pick up a couple I'd been meaning to try! I've worn and photographed Serum No. 5- Galactic Rainbow (actually still on my right hand, atm! ), and it is stunning! Swatches at some point in the future! Elevation Polish- Devil's Cauldron was a huge lemming of mine, and I picked Mill City Ruins up because I still have not tried a single thermal polish. Can you believe that?! I'm torn on which of these to swatch next...was thinking maybe Storms of Marmolada. Ideas? Now, I'd love to know what you'd prefer to see swatched next! Serum No. 5- Galactic Rainbow is coming, and I'm intending to do the Spring 2015 KBShimmer polishes, but haven't begun swatching them yet. What else should be prioritized? Anyway, I'll still be reading blogs, and I will probably be around on Instagram as well, although I probably won't post trip photos until after the fact. Take care until the 30th, everyone! Awesome haul of new polishes! And that Paul & Joe... So pretty! I love their bottles! Wow that is quite the haul! And I just put in an order for the Creative Stamper as well, but its a preorder so it's probably going to be awhile for me! And you've sprung a new lemming for me Elevation Devil's Cauldron, I'm just loving that brand lately! I hope you have a fun week away! I just found your blog and I just love it. That Creative Stamper!!! Wish I could get my hands on one! What a great haul! Your pup is adorable!!! Love your dog! And your polishes! Haha, it adds up after three months! Shameful! :hides in corner: YES! I can't wait to try Devil's Cauldron- wanted that one for so long! Thanks, Kellie! <3 That's so nice to hear from you! Oh no, which one was it? I've still never tried Ciate, hmm... YES, the Paul & Joe polish bottles, YUM! Thank you! I need to slow down the polish intake, LOL!